A nonsurgical root canal removes the inner layer of your tooth, called the pulp. Your tooth is sterilized and sealed using a material called gutta-percha before a custom-made dental crown is placed over it. Often, this is enough to restore the health of an infected tooth. Unfortunately, there may come a time when a root canal can fail. The roots of the teeth can be rather complex. Some teeth, the molars, in particular, have various canals that may be difficult to fully clean during the initial root canal. This can leave bacteria and decay within the tooth, which can lead to an unsuccessful procedure. Complications may not be immediate. Instead, reinfection can occur several years later. The most common cause of a failing root canal is from an infection that develops or continues after the treatment. Now, your tooth cannot be saved using a conventional root canal. Instead, you need an apicoectomy. This is a minor surgical procedure to remove the very tip of the tooth’s root, called the apex. 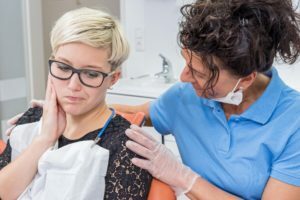 The latest advancements in dentistry now make the procedure less invasive; however, to ensure your comfort, a local anesthesia is used. Your endodontist makes a small incision in the gum near the tooth to expose the infected tissue. The tip of the root is removed and the end of it is sealed using a small dental filling. Your endodontist sutures the tissue closed and your bone heals around the tip of the root over the next several weeks. It is normal to experience some slight discomfort and swelling while you heal, but you will be able to resume your normal activities. Your endodontist will give you advice regarding the foods to eat and how to maintain your oral hygiene while you recover. If a previous root canal has failed, you do not need to have your tooth removed. Instead, it can once again be saved with restorative dentistry to stay in place for many years to come. Dr. Deborah Bishop is a reputable endodontist in the community who specializes in saving compromised teeth. She not only performs root canals but also apicoectomies. Dr. Bishop uses the latest techniques and technologies to ensure the success of your procedure. If your root canal is failing, Dr. Bishop can help. Contact our office today to schedule a consultation to save your smile.